The 15th Biennial Challenger Conference for Marine Science recently took place at the University of East Anglia in Norwich, on 3-6 September 2012. There were over 100 talks, 150 posters, a contentious debate on wind power, and a talk on how the UK can maintain its current research infrastructure. Over the next week or so Words in mOcean will be bringing you a recap of the best of the action, starting with four of the keynote lectures. Today’s recap is on the lecture given by Ken Buesseler, titled ‘Controls on and variability in particle export and flux attenuation in the ocean’s twilight zone’. Enjoy! 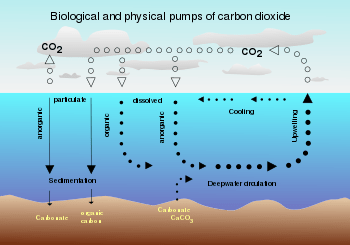 The “biological pump” refers to the process whereby an almost unimaginable amount of carbon (over 10 gigatonnes of carbon per year), fixed in surface layers of the ocean, sinks out of the euphotic zone. Understanding this phenomenon has important implications for our understanding of the global carbon cycle (and climate change) as well as food sources to the mesopelagic and deep-sea. The speaker discussed how in the ‘twilight zone’ (beneath the euphotic zone, down to 1000 m), most of this downward particle flux is remineralised; however, we still have a relatively poor understanding of these processes, and how they vary across different geographic regions in the ocean. This is said to be due to “variability in methods” (e.g. sediment traps, radionuclides and optical approaches), “lack of data” (especially covering seasonal/annual timescales), and “the metrics used to paramaterize export efficiency and flux attenuation”. Consequently, current global models lack the complexity, and underlying understanding of how particles are transported, to adequately represent observed biogenic fluxes to the deep-sea. The speaker talked about the need to use multiple (standardised) methods in order to study particle fluxes, and talked about some of the most promising methods currently in use. The speaker’s own lab has recently been using a video plankton recorder (VPR) and gels in order to get an instantaneous idea of particles distributions in the water column; this has then been combined with sinking rate observations in order to derive an estimate of fluxes to the deep-sea – interestingly, the speaker says that there is a U-shaped sinking speed distribution with increasing cell size, an observation that is not predicted by Stokes’ Law. Using this approach it has been shown that sinking speeds are greater in Antarctica (where there is a bimodal particle-size distribution) than Bermuda (where particle size is smaller and less variable). An optical approach of Jim Bishop’s lab (U.C. Berkeley) was also mentioned, whereby a transmissometer monitors the water column over a period of days looking for individual sinking events: sinking speeds can then be calculated based on sinking distance and time taken. Whilst some of these methods are no doubt an improvement on old methods, the speaker stressed the that there is still room to improve all methods further. One important point he raised was the need to adjust where traps are set, dependent on the depth of the euphotic zone (how far below the euphotic zone you are effects the particle flux you observe: if you are closer to the base of the euphotic, you tend to see a higher flux of particles as less remineralisation will generally have occured). This can be done relatively easily using a fluorometer to measure chlorophyll concentrations; avoiding doing this (which is currently standard practice), risks hiding variability, making it very hard to balance carbon fluxes. The speaker even discussed a method he has devised, and applied, to retroactively analyse previous open-ocean studies, taking the depth of the euphotic zone into account1. 1) Buesseler, K,O; Boyd, P.W. (2009). Shedding light on processes that control particle export and flux attenuation in the twilight zone of the open ocean. Limnol. Oceanogr., 54(4), 1210–1232.